Haas comments frequently on public issues. He writes a foreign affairs column every two weeks for U.S. News & World Report and pieces for other outlets. Over the years, his pieces have appeared in The New York Times, Wall Street Journal, USA Today, Los Angeles Times, Philadelphia Inquirer, Baltimore Sun, Miami Herald, Houston Chronicle, San Diego Union-Tribune, and scores of other newspapers. He has written articles for The Journal of International Security Affairs, DEMOCRATIYA, inFOCUS, Tax Notes, and other magazines. Haas has appeared on CNN, FOX, CNBC, C-SPAN, Voice of America, Al Hurra, NPR, the BBC, CTV, and many local TV and radio shows; spoken before hundreds of trade groups; served as a guest lecturer at the Government Affairs Institute and Legislative Studies Institute; and spoken at Yale University, Pennsylvania State University, George Washington University, the University of Missouri, University of Maryland, University of Rhode Island, and Montgomery College. He has been a commentator on “MarketPlace,” a business radio show on nearly 400 stations across the country, and he created and wrote “Public Affairs Perspective,” an on-line column for the global PR firm Manning Selvage & Lee. Haas has written five books, contributed chapters to others, and ghostwritten still others. 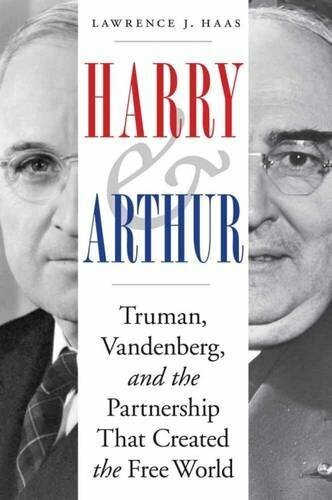 His latest book, Harry and Arthur: Truman, Vandenberg, and the Partnership That Created the Free World, is the untold story of how Democratic President Harry Truman and Republican Senator Arthur Vandenberg worked together in the perilous late 1940s to produce a revolutionary new U.S. foreign policy that has served America well ever since – with the United States seizing global leadership to protect its friends, confront its enemies, and promote freedom. His previous book, Sound the Trumpet: The United States and Human Rights Promotion, published in June 2012, chronicles U.S. efforts to advance freedom and democracy abroad particularly since World War II. Previously, he wrote two editions of The Washington Almanac (1992 and 1993), which described key policy debates and policymakers in Washington, and Running on Empty: Bush, Congress and the Politics of a Bankrupt Government (1990), which chronicled policymaking under the first President Bush. Haas contributed chapters to Governing to Win: Enhancing National Competitiveness Through New Policy and Operating Approaches (2012) and Getting it Done: A Guide for Government Executives (2009). He helped ghost-write From Red Tape to Results, Vice President Gore’s report on reinventing government (1993), and he ghost-wrote Gore’s Creating a Government that Works Better and Costs Less: Status Report (1994). Haas moved to freelance writing after a distinguished career in journalism. He began as a municipal and county reporter for the Daily Register in Shrewsbury, NJ. He then served as a statehouse correspondent for the Pittsburgh Post-Gazette and statehouse bureau chief for United Press International (both in Harrisburg, PA) and as a budget and tax reporter for the Bond Buyer and National Journal (both in Washington, DC). In 2011, Haas testified before the House Judiciary Subcommittee on the Constitution on “The See Something, Say Something Act of 2011.” In 2009, he spoke at an international conference on Iran in London, sponsored by the Henry Jackson Society and the Legatum Institute. In 2007, he testified on Iran before the House Oversight and Government Reform Subcommittee on National Security and Foreign Affairs. In late 2009, the Obama transition office asked Haas to direct the process of securing U.S. Senate confirmation for President Obama’s nominees to the White House Office of Management and Budget, including Director Peter Orszag and Deputy Director Rob Nabors. He held that position until early February 2010, when the new Obama administration took over the process for its pending OMB nominees. Haas was Communications Director and Press Secretary for Vice President Al Gore, serving as his spokesman; helping to craft his strategic message; overseeing his media interviews, speeches, and public announcements; editing his speeches and other materials; and managing a staff of 10. Before that, he was Communications Director for the White House Office of Management and Budget, serving as spokesman for OMB and Directors Alice Rivlin and Frank Raines; speaking for the Clinton Administration in hundreds of TV, radio, and print interviews; structuring and editing the President’s annual federal budget; creating and writing the annual Citizen’s Guide to the Federal Budget; writing speeches; and editing other materials. After his White House tenure, Haas served for two years as Director of Public Affairs and Special Assistant to the President at Yale University, where he was a senior policy advisor, led Yale’s communications efforts, served as its principal spokesman, and supervised 20-25 employees and interns. From 2001 to 2005, Haas was Senior Vice President and Director of Public Affairs at Manning Selvage & Lee (MS&L), one of the world’s largest public relations firms. There, he served as the senior counselor for clients confronting legislative and regulatory issues and as a strategic resource for clients throughout the firm. Since January 2006, he has worked as an independent public affairs consultant.